From the opening track Hanging Church (feat Spencer P. Jones with a trademark solo) The Braves take you on a sonic ride that will convince you that they are on the up. 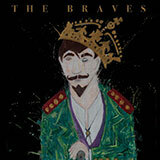 Formed late 2012 on the outskirts of Melbourne, Australia, The Braves came cutting through the surrounding noise to create a sound and a notoriety that is uniquely their own. Their first album for Spooky Records 'All Through Paradise" was released in Feb 2017 and they're now gearing up to release their 3rd album 'Carry on the Con' on Beast Records. Touring Europe March / April 2018.